Surgeons put the steel and carbon fibre hearts in them so their hearts can stop and go. How else to keep the cattle and birds, the men and women and children, from being fried by the continuous lightning strikes down on Catatumbo IV? Olwen takes an x-ray of each living thing, to be sure it’s not birthday standard, before he allows them to board the lifts for their one-way trips. Even newborns. Even canaries in cages. Right now, at the end of his shift, the queue that floats in his segmented white tunnel is stalled by that stubborn multimedia magician. Again. Olwen has grown, over the past six Cat-Four months, to hate the sight of the woman; he loathes her gently fluorescent teeth and her short, otter-thick hair, her stupid purple cape with the silver stars that floats in zero gravity and gets stuck in the ventilation, and, last but not least, her ill-founded conviction that the heart she was born with can handle the repeated electrical discharges from the Continuous Storm into the Bright Plain. A flesh and blood heart, now, it’s supposed to be receptive to the signals sent to it by its pacemaking masters; any blockage in the conduction of electrical impulses through fibres or depolarisation in muscle is considered a defect. Not so in the steel and carbon heart. Steel for conduction, yes. Inexorable carbon to do the work, the enormous work, of forcing a bucket of blood through the microscopic eyes of a billion microscopic needles. But also to insulate the package when required. To keep the pacemaker cells from dying. Wirelessly, the space elevator switches off their hearts as they travel through the heart of the Continuous Storm. Their blood pressure plummets. They stagger against one another. Canaries crash to the floors of their cages. But then they get up again. The settlers laugh. Grasp one another and breathe desperate, relieved breaths, shaking the pins and needles from their extremities. A bump in the lift, they tell one another. A wobble in the elevator’s tether. Sixty kilometres from orbit to New Maracaibo’s Lake-shore is one heck of a cable, isn’t it? I wasn’t scared it would snap. Were you? Then, they’re sent out to hand-plough their rain-sodden land allotments. Radio wave patterns give warning a fraction of an instant before the inevitable ionised path envelops them. This time, they wake fully feeling what and why; they realise what actually happened in the elevator as they passed through the horizontal cloud-to-cloud lightning zone. The rare returnees have told him that they never really get used to it. Home is where Houdini’s girlfriend, Carmela, waits with her eyes glazed in a pretence of patience. Houdini wraps herself sullenly in the purple cape and throws herself onto the airbed. Carmela contemplates, for the thousandth time, the tempting possibility of sabotaging the bed so that its many vertical jets no longer cushion Houdini’s crooked wire of a body. Maybe then the idiot will stop thinking she can fly. Houdini kicks the switch on the end of the bed, increasing the pressure of the jets so that instead of floating mere millimetres above the plastic table, she’s now arm’s length from it. On the Space Worker’s Union shuttle where they’d first met, during the trip from Earth’s moon to Cat-Four’s, they’d gotten so used to sleeping in zero-gravity that even when they’d bought the apartment in the inner ring of the rotating station, the one where there was the lower limit of osteoporosis-preventing legal gravity, they’d wanted air beds at once. “Including me,” Houdini shouts over the roar of the jets. Carmela marches over to the foot of the bed. Instead of switching it off altogether and enjoying the face-first thud of her partner into the solid base, Carmela controls her impulse and simply switches it back to low. Her stomach growls. She’s hungry, too. The space station doles out dehydrated rations in an emergency, but that’s not the lifestyle they enjoyed until six months ago when Houdini was seized by inspiration for a new stunt. They had been enjoying the fresh produce of Catatumbo IV. “Boring!” Houdini’s voice is muffled. She’s still hiding in her cape. Houdini sits up abruptly. Without the minimum surface area for the jets to press against, she’s no longer floating. Her bottom blocks half a hundred of them and the valves whistle annoyingly where the venting air escapes. Carmela clasps her hands tightly to keep from trying to throttle Houdini. She musters a dignified expression and sits on a bolted-down stool. Together, they close their eyes. On the inside of Carmela’s lids, the feed is dark; switched off. Houdini leaves hers on all the time, Carmela knows. She waits while it energises, synchronises and loads. Then, with a sequence of eye movements, she flicks to four-three-seven. A woman in a space suit is loaded into an actual cannon on the crater-pocked surface of the moon, gunpowder charges and oxygen bags packed in around her feet. A purple cape with silver stars is tacked onto the space suit. Carmela groans. She keeps her eyes closed, watching. There’s no sound as the cannon fires. With a flash of orange fire, the suited shape, its feet apparently burned away to skeleton sticks and with oxygen leaking out of the suit in a stream of miniature floating flames, rockets away from the camera’s view. Those false feet cost Carmela ten thousand credits. She grimaces at the sight of them. The next shot shows Houdini being collected from orbit, her cape a tattered, blackened flag. Cut to the inside of the shuttle, and there she is, bowing, flourishing and unharmed, her yellow teeth gleaming in triumph. A new record for shipless flight. Carmela resigns herself to the inevitability of Houdini’s death every single time they are apart. “It paid for itself, didn’t it, in the end?” Houdini declares. Carmela opens her eyes. She sighs. “So are we,” Carmela points out. Olwen doesn’t recognise her til the last minute. This time, in place of the purple cape, Houdini wears a black suit and a blindfold. Floating behind her on a brass chain like a tame animal is a pocket-watch in the shape of a steel and carbon heart. The doors to the x-ray chamber are closed. Olwen does not press the button to open them. Furious, he pulls himself, hand over hand, down the rungs and lets himself into the entry tunnel. Her left hand darts out, striking a blow, palm-first, to his chest. When she pulls it back, blood covers her hand to the wrist. She holds a flesh and blood heart. Perfectly spherical crimson boluses float around them. Olwen shrieks. For an instant he’s sure he can’t feel his heart beat in his chest. She’s a magician. It’s a fake. But why can’t he feel his heart beat? Then he feels it, a low pounding. When he looks down, he sees Houdini’s right hand pressed against his ribs. The brass chain which was connected to the pocket-watch now ends between her fingers in the folds of his uniform. Olwen lets go of the rung and throws her into the gabbling and flabbergasted crowd. Without gravity, he flies away as well, crashing into the closed doors of the x-ray chamber. He pants heavily, as though the brass chain is around his throat, not dangling in the air above the tangle of settlers where Houdini’s skinny shape has vanished. When she re-emerges, apologising to the angry queue of immigrants, her hands are clean. There’s no sign of the red, meaty lump that she held; no sign of the heart-shaped pocket-watch. Sleight of hand, Olwen thinks as he gasps and gasps. “Get out of here!” he shouts at last. After she’s gone and the last of the spheres of blood are sucked up into the ventilation, Olwen checks his bare chest under the uniform. Not a single scratch. Not a stain on the fabric. When his shift finishes and he goes to his staff meeting at the station, though, the first thing the cleaner asks is why he didn’t fill out an accident report. “What accident report?” Olwen asks, keeping the strain out of his voice. He should not allow Houdini to affect him, so; should wipe his mind clean of her. Olwen doesn’t answer. He’s so rattled that he almost fails to notice when he floats into the windowless meeting space crammed with two dozen men and women, the way everyone but the cleaner avoids his gaze. When settlers get in the elevator, Olwen warns them to attach to the roof, even though their instinct is to point their feet down, toward the planet. The inner capsule of the elevator inverts at the appropriate point where Cat-Four’s gravity overwhelms the false gravity of acceleration. Here, the seats are on the long wall behind him. He reorients as his fingers tighten on the chair’s handholds, pulling his buttocks and thighs into the shaped saddle of it. The supervisor smiles at him again. Olwen despises his lopsided, lying face; the charm with which he convinces the settlers to sign their lives away. Olwen, already weakened by Houdini’s hold on him, is freshly dumbstruck. His eyes feel dry and he realises he hasn’t blinked; just continued to absorb the sight of the supervisor’s black-streaked, tawny mane, the kind of hair arrangement that only looks good in zero gravity and gets in the mouth when one dons a helmet. The planet end. They’ll take his heart. Separate him from his son. The first time the supervisor called him O-Negative, they’d been waiting around for the annual tether strength test to be completed. Nobody really likes you, Olwen, do they? He’d said it without emotion, as though commenting on the weather. Kind of gloomy, aren’t you? The comms kids call you O-Negative. Olwen thinks the hot showers will be a poor excuse for never seeing his son again. Because of the native microbes, nobody is allowed to return from Catatumbo IV. Only the very highly skilled, whom the Government have forced down to the planet’s surface, are allowed to travel back up the elevator, to have their bodies completely purged of foreign DNA at a billion hapless taxpayers’ expense. Olwen pays for the manufacture of the platelet infusions his son needs. Haemophilia prevented Ben from being forced to settle on Cat-Four as soon as he reached adulthood. He’s unlikely to survive open heart surgery. Labouring jobs on other planets were also deemed too risky. Let me through and I’ll do the same for your son, Houdini had said. I’ll do what no surgeon can do. How had she known? Only medical professionals should have access to Ben’s records. Olwen has no choices. None. If jobs were easy to find, wouldn’t the settlers be working those jobs, instead of mortgaging their own hearts to get to the Bright Plain and then spending decades paying the money back again, jolted between life and death, labouring in continuous lightning and gravity-sharpened rain? He has to take the planet-side job they’re offering. Otherwise his son will die. They won’t execute Ben. They won’t even stop feeding him. They’ll simply let him be, and one day, when a micrometeor threads its way through him, or perhaps just the roughage from a particularly low-grade salad, he’ll quietly bleed to death while medics attend to the ones who can afford it. Carmela meticulously tightens the nut. She hangs, white-suited, by her knees from a strut at the very centre of the rotating station. The planet’s dark side lies far below her, bruise-purple and black, the enormous Continuous Storm sizzling like an electric eel in a pot of ink. The Bright Plain is the only place the native predators won’t go, and so the only place suitable for human habitation. Above it, in geosynchronous orbit, connected by a tether invisibly thin at this distance, the spicules of the elevator dock gleam silver. That’s where Houdini is, right now. The elevator dock. If Houdini manages her stunt, Carmela will have to make that long, terrifying journey down the tether. Not to live on the Bright Plain with the poor settlers, but in the mountains that surround the Plain on three sides. There, parallel to the sheer cliffs where pronged rivers pour their frothing waters into the Lake, are lightning-capture power stations in need of experienced managers; they need technicians with Carmela’s exact qualifications. She and Houdini must then remain planet-bound forever, so that Houdini’s trick can never, ever be uncovered. They’ll have to upgrade their air beds but there should be plenty of money for that. You going to marry this girl? Carmela’s surgeon mother had demanded as she implanted Houdini’s heart. You love her? I love her, Carmela had admitted, but I can’t marry her, Mama. She’s going to kill herself, sooner or later. Carmela’s mother made as if to abandon her tools. You ask me to do this for you, Carmela! I know, Mama. Thank you. Don’t stop. Houdini will kill herself, sooner or later. The heart she has, her secret heart, is not only designed to stop and go. Its higher-power source is capable of releasing a timely, simultaneous x-ray burst to confound Olwen’s older, low-tech imaging machine. The stunning white signature of the steel components of the heart will be hidden, blotted out by the interference, so that Houdini passes for flesh and blood. But what if Lake Maracaibo’s lightning strikes, or the fluctuating electrical fields, send Houdini’s heart berserk? What if the x-rays shoot out again, and again, until it’s not just Houdini’s teeth that glow, but her cancer-riddled liver and lungs? Even if that doesn’t happen, she’s sure to think up another stunt. The trick-heart kept her awake for three days straight, and Carmela didn’t exactly sleep well, either, thinking about her mother’s key card, which Houdini had borrowed without asking so she could help herself to some of Olwen’s archived blood. Houdini will kill herself, sooner or later, and then Carmela will be alone, surrounded by the Continuous Storm, looking down on the toiling farmers of the Bright Plain like she’d never wanted to look down on anyone. It was why she’d left the rotten inequality of Earth, she and all her family, too soft-hearted to walk past the starving masses any longer. Carmela closes her eyes for a moment to check on the live newsfeed. If Houdini has gotten past the gatekeeper, her heart-stopping descent down the space elevator will just be beginning now. Nothing. Nothing in the news about her never-wife, anyway. Carmela feels frustration and relief fighting for inner sway over her. She flicks off the feed and opens her eyes. The storm is still there, terrifying and searing. It’s not the first time Olwen has considered the short list of folks to bid eternal farewell. Everybody should make a list like it, sick or well, he thinks; it’s healthy. To know who really matters. With his wife gone, the only one that really matters is his son, but Olwen does not say goodbye to Ben. Instead, he shows him the drive where the security footage is kept. Olwen’s wife went down in the space elevator fifteen years ago, expecting that Dom would soon follow. Perdita had laughter in her gray eyes and a black mole on one white earlobe. Some kids down on the surface with too much time on their hands set up a hand-held transmitter to trigger people’s hearts to stop, as a prank. Only, they set it up wrong and Ben’s mother died. The three kids, adults now, are still in prison, but that’s no consolation. “I suppose I will,” Olwen says, covering the sharp corner of the key panel with his hand as Ben floats past it, out of habit. Scratches are nothing to him. Everything to Ben. Olwen’s heart races as he remembers the feel of Houdini’s hand on him, the chain between her fingers. Perdita’s body will have long ago returned to the Catatumbo soil from whence it did not come. The metal parts of her heart, in the marshy ground, will have rusted away. Only the carbon parts will still be there, inhabited by the native bugs which prevented her body from being returned for a decent space burial. Olwen does not want a heart like that; will not accept a heart like that. He remembers what Houdini said to him, the first time she came floating down that tunnel. Don’t you believe in miracles, Dominic? Haven’t you heard of Roy Sullivan, a park ranger, on Earth a hundred years ago? He survived seven lightning strikes, and do you know how? Do you know why? His heart was full of love for his wife. He got the burns on his skin, you know, burnt strips off his arms and legs, his eyebrows, eyelashes, his hair on fire, that sort of thing, but lightning could never stop his heart. Not until he fell in love with a different woman, and then he shot himself because she did not love him in return. Have you seen my friend, Carmela, on the feeds? My heart is so full of love for her, Dominic, that even the Bright Plain cannot hurt me. Trust me. Let me go down. Olwen will not let her go down. Before she can approach him again, he will make the journey himself. He will do it with his heart full of love for Ben. His blood in the filter. The chain between her fingers. The things Houdini knew, which she couldn’t have known. Ben should never have survived being born, but he did, didn’t he? Olwen is moved by her powers. Carmela washes her hair carefully in the semi-gravity. She shrieks with protest when Houdini throws open the cubicle door and wayward globules of warm, recycled water begin escaping into their room. “What’s stupid?” Carmela shouts, squeezing her eyes shut against the suds, reaching her other hand blindly for a towel and finding a sleeping cover instead. By the time she’s wrapped it around her, the feed behind her eyelids has come on. She sees the terrible footage, played over and over as the newscaster’s voice gives a blow-by-blow description of the incremental injuries, the precise time, to the microsecond, of each strike. Dominic Olwen gets into the space elevator, alone. He fastens his feet to the ceiling and gives the camera a sad wave of farewell. Shown in a window in the screen is his x-ray, sans white blaze of steel and carbon heart. The space elevator descends into the Continuous Storm. The inner capsule inverts. Olwen puts his right hand over his chest as the first strikes light up the elevator. At first, it acts as a Faraday cage. Then it’s overwhelmed. Olwen’s eyes and nose and mouth glow horribly. Smoke obscures the screen. When it clears, Olwen does not rise, laughing and joking. Carmela opens her eyes and finds Houdini racked with sobs. Carmela tugs gently on Houdini’s cloak. It comes off in her hands like a sloughed skin; Carmela exhales as though expelling all her uncertainty and fear. It is over, now. Houdini will not go down to Cat-Four. All her tricks, all her magic, is at an end. Carmela will get to keep her. But the act rouses Houdini. “Give me back my cloak!” she rages. Carmela feels the blood drain from her face. Carmela sits on the floor with the soap stinging her eyes, watching the magnificent Houdini flutter from place to place, silver stars glinting like the Continuous Storm in the dark purple backdrop of night-cradled Catatumbo IV. She knows she will follow. She knows she’s tethered as tightly to Houdini as the elevator is tethered to the Bright Plain. Even when she tries to make her heart stop, the sight of her lover is enough to make it go. Stop and go, stop and go. When it comes to Houdini, she has no insulation. Thoraiya Dyer is an award-winning Australian writer. Her short science fiction and fantasy stories have appeared in Clarkesworld, Apex, Analog, Nature, and Cosmos, among others (for a full list, see www.thoraiyadyer.com). Her collection of four original stories, Asymmetry, available from Twelfth Planet Press, was called “unsettling, poignant, marvellous” by Nancy Kress. 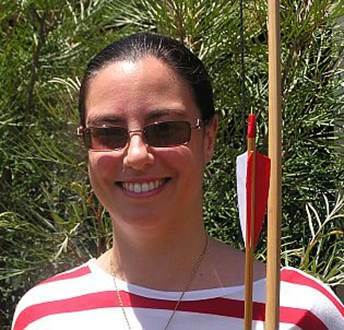 A lapsed veterinarian, her other interests include bushwalking, archery, and travel.